This podcast is somewhat a detour. I had intended to cover “That Hideous Strength“, the third and last book in C. S. Lewis’ space trilogy. However, I was invited to participate in an interview on my favorite C. S. Lewis essay, and I chose “Fern Seeds and Elephants” for my subject. I did some research to prepare for the interview, and the interviewer, William O’Flaherty, kindly suggested that a podcast on the essay would compliment his interview very nicely. Hence this podcast was born. This essay aro se from a lecture that Jack presented to students at Cambridge who were studying to become priests in the Church of England. 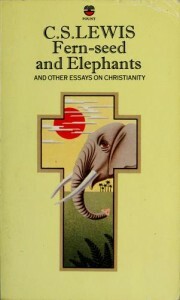 Its subject is a type of Biblical criticism that was in vogue then (1959) and is still popular today. The proponents of this approach to understanding the Bible have concluded that much of what Christians have believed about Jesus is incorrect, and that many of the stories about Him in the Gospels are myths or legends, not history. (For example, the story of Jesus changing water into wine at Cana of Galilee is not a miracle but a parable). By applying their techniques and using their analysis, we are at last able to understand what the New Testament really means. Jack offers four major criticisms of their technique and assumptions in the essay. If you are interested in Biblical in interpretation or if you have ever wondered if books like “The Da Vinci Code” could be true, then you will find this essay quite interesting and informative. You can listen to my interview with Mr. O’Flaherty at the link below. I recommend this as it will provide you Mr. O’Flaherty’s insights on the essay. This entry was posted in Bible, C S Lewis, Christianity, Church, Theology and tagged Bible, C S Lewis, Christianity by Reggie. Bookmark the permalink.